Three out of four New Zealand doctors have prescribed placebo medications to patients, new research suggests. Medical researcher Shaun Holt said the practice could be costing the taxpayer several million dollars. Placebos are associated with the release of natural painkillers in the brain, including dopamine. Taking a placebo creates a "self-reinforcing feedback loop" in the brain: during pain an individual recalls having taken the placebo and reduced pain reinforces its status as a painkiller. About one-in-three people appear susceptible to placebo effects. Doctors are quite probably adept at identifying the one in three. And what about prescribing drugs as a diagnostic tool? If the doctor guesses wrong, the drug 'doesn't work'. But it does eliminate one possible diagnosis so hasn't been a waste of money. There is a subtle but significant difference between a drug not doing what it is therapeutically supposed to do and it being a waste of money. To date, the government’s response to the recession has been faulted on the demand side – for not giving sufficient stimulus to the economy, as reflected in its wilful misdirection of most of the April tax cut money to the top tier of incomes, when low income earners would have spent the money to far better economic effect. The lack of proper planning and funding for social welfare provision has been just as disastrous. Right now, the government seems intent on forcing more and more of the victims of this recession into fewer and fewer job openings. On National Radio this morning for instance, Social Welfare Minister Paula Bennett could be heard riding off energetically in all directions. Why, she was going to hand the Disabilities portfolio over to Taraina Turia in order to concentrate on getting people into jobs! We were dreaming, Bennett said, if we didn’t think that unemployment wasn’t going to increase. Fabulous. So, beyond the slogans and empty gestures, would she be relaxing any of the eligibility settings for assistance, in recognition of the scale of the recession? No, not at all. Earlier this year, Bennett refused to instruct her staff to exercise discretion when it came to dispensing help through the Temporary Additional Support (TAS) scheme – which is the last line of defence for people in danger of slipping through the welfare safety net. Now was not a time to ‘tinker’ with the rules, she told me when taking questions about the government’s response to the recession, at a post Cabinet press conference. In similar vein, Bennett is refusing to revisit the eligibility rules in households where one partner is still working. Currently, as Sue Bradford of the Greens has pointed out, couples with an earner in paid employment need to be amassing below $534 a week before the unemployed partner can qualify for the dole, or the DPB. This rule is, among other things, serving to keep the welfare figures conveniently and artificially low. As Bradford says, the situation is putting pressure on couples to split, in order to gain access to assistance. Shouldn’t Christine Rankin and the Families Commission be having something to say to Bennett about her eligibility rules? She and her husband Neville have started selling their possessions. “Because my husband earns just above the income limit for a couple, I cannot register for unemployment,” she said. So, it is all very well for the government to say it is concentrating on getting people back into work. Already, the inadequacy of this response is evident : because there are not enough jobs for the people, and for the families, most at risk. Eligibility rules for assistance that have been premised on a relatively healthy job market and a ready return to employment are no longer adequate. Still, this government currently seems uninterested in responding to genuine need – it is more about spinning an appearance of concern, for the re-assurance of the majority still in work. It would take five minutes for Bennett to issue a direction that people with partners in paid employment can access the unemployment benefit. She should also be telling her front line staff to administer the TAS benefits with discretion, and according to need. Yet that would be to assume that this government has an interest in steering New Zealand through this recession with anything other than its own welfare in mind. But socialists have traditionally despised the idea of discretionary entitlement. Universal rules and rights-based entitlement is their ideal. In order to provide such, means-testing has to be applied. That allows targeting of the neediest. The eligibility rules have been premised this way since the first Labour government introduced Social Security. Welfare benefits are paid from general taxation. If people want better cover, then the country needs to change to a more comprehensive insurance-based model. So Bradford is now admitting that there is a problem with sole parent families. This is only because, she would counter, their benefits are insufficient and their children live in poverty. But now she is suggesting that couples be given preferential treatment in terms of how much household income they can acquire via welfare. You really should be thanking Paula Bennett - not attacking her - for sticking with the welfare philosophy of the Left. State, universal, means-tested, rules-based, entitlement. Yesterday the Ministry of Social Development released their annual statistical report - 1 year after the most recent statistical information contained therein. It covers the 30 June 07 to 30 June 2008 period. That means we can look forward to having current statistics available in a year's time. 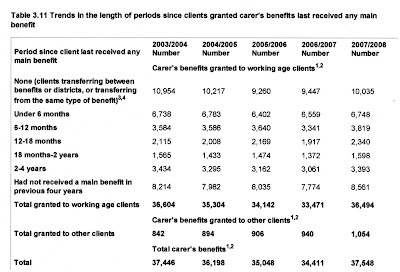 At the end of June 2008 there were 258,317 people on a main benefit. Towards the end of June 2009 there were 302,000. So some trends depicted in the report have reversed. 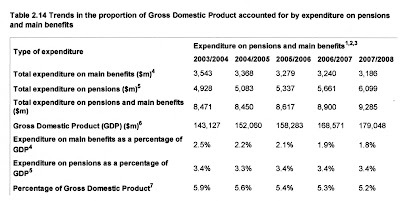 Firstly this table shows welfare expenditure as a share of gdp. Note that the total expenditure on pensions and main benefits was $9,285,000. Yet if you check 2008 Crown Expenses tables you will actual 2008 Social Security and Welfare spending at $17,877,000. This includes all of the other expenditure like accommodation supplement, emergency benefits,etc and the cost of running the whole kit and kaboodle. That pushes the share of gdp up to just short of 10 percent. The share of total government spending is 31 percent. The next is interesting because it illustrates the extent of DPB 'churning'. 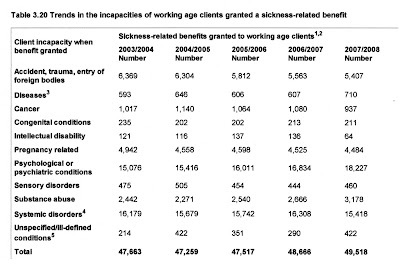 These figures relate only to grants - not total numbers of recipients. 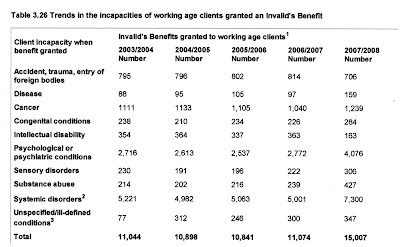 Of the 36,494 people granted the DPB in 2007/08 only 23 percent had either never received a benefit before or not within the last four years. Over three quarters were transferring benefits or returning. This indicates being on the DPB is more a way of life than an unusual and temporary event. The next two tables again show grants, not total numbers, and provide reasons for those grants. There was a big annual increase in invalid benefit grants (36 percent) and psychological and psychiatric conditions continue to trend up with both invalid and sickness grants. Nearly all of the growth in sickness grants was due to psychological/psychiatric disorders and substance abuse. The introduction of a complex regulatory framework - with a Medicinal Cannabis Registration Board being established to issue Medicinal Canabis Identification Cards and Designated Agent Identification Cards - A Designated Agent is required to prove him or herself to be of good moral character. I totally object to that phrase being inserted in NZ law. What is that about? A facet of the religion of 'non-judgementalism', a dogma adhered to fanatically by the Left and promulgated thoughtlessly through various state institutions? It is hardly surprising that many people now exist in a moral vacuum. If good moral character is archaic and unmentionable, what are we left with? More interest in the smacking referendum than the 2008 general election? At 14 October, 2008, "... around 200,000 people still weren't enrolled." On 4 November, 2008, there were, "...170,000 people who are still not enrolled to vote on Saturday." So in those 3 weeks preceding the 2008 General Election only 30,000 people enrolled to vote. In the two weeks since the smacking referendum campaign was launched by the Electoral Commission, over 25,000 have enrolled or updated their details. While not directly comparable these figures provide some context. People appear just as, or more motivated, by the smacking referendum. Great. New Zealanders are not going to be told that the referendum is a waste of time. Bad call John Key. More than 25,000 people have responded to the call to get enrolled or update their enrolment details to take part in the upcoming referendum - but there are still many more who need to take action today. In the two weeks since the official campaign started to raise awareness of the referendum on the question “Should a smack as part of good parental correction be a criminal offence in New Zealand?” at least 25,000 people have updated their enrolment details or enrolled for the first time. “We’re recording an average of over 2,000 people a day taking action by enrolling or updating their details to get ready to vote in the referendum,” says Murray Wicks, National Manager, Electoral Enrolment Centre. It is only 7 months since the election when most motivated people would have been up-to-date. Around 33,000 young people will have turned 18 during that time and many people will have moved. But I think 25,000 is quite significant. Especially when it is also quite typical for people to wait until the last minute to take action. Back in 2005 one of the most controversial issues was the passage of legislation that would force sheltered workshops, which employ intellectually disabled people, to pay the minimum wage. This was a Labour move, backed by the unions, besotted with equal pay. ACT in particular, led by Muriel Newman, warned that the change would lead to the closure of workshops and the loss of jobs. The arrogant Ruth Dyson sailed on undeterred by the pleas of families whose main concern was to keep their sons and daughters employed and with purpose and meaning in their lives. The Hutt News yesterday reported that after twenty four years Packworx would close leaving 23 intellectually disabled workers without jobs. In 2006 it had employed 60 people. At the time Labour announced it was repealing legislation that covered sheltered workshops, around 3,000 people were employed in the sector. Mrs Gray said some workshops closed immediately and a good number of others shut up shop when the legislation came into full effect on December 1 last year. I suppose the women that marched on Parliament yesterday want similar equalising legislation. How does the saying go? Be careful what you wish for because you might just get it. When in need, most New Zealanders now believe that strangers, rather than their own families, should support them. The radical feminist, the minority rights activist, and the Marxist succeeded in putting the machinery in place whereby the state would be a more influential institution than the family. The machinery was the law coupled with insidiously growing welfare benefits. Now minds and psyches have been infiltrated and most people won't even realise what has happened. While I am not much on conspiracy theories, there were handfuls of people who had active agendas at various times and over time. On the whole, however, the process has been a haphazard series of what appeared to be good intentions (with resulting political and public buy-in) gone bad. The dole threshold level must be increased to help working people in these extra ordinary financial times..... it is really important that our government act with speed on this matter. I hope all the people that are saying that the situation is fine the way it is could live on $534 a week to cover all their costs of living and someone else's. Reality is these days if you are paying off your own home and one person in the relationship loses their job then 1 income isnt going to pay the bills. Many married couples keep their finances seperate these days.The $80 earning limit is now also a joke while power, insurance and petrol esculate. The $80 limit plus the connection with what the wife is earning will end up making us all get a divorce to get the dole which nobody can live on anyway. Of course you should be able to get the dole if you have paid taxes you are entitled to it, should have no bearing upon whether you have a partner or not. The dole system should not discriminate against anybody. It shouldn't matter if one partner is still working. That partner is still contributing tax and the more they are earner the more tax they are paying. Why this discrimination is allowed to continue, I have no idea, but marital status shouldn't enter the equation, when one partner loses employment and the other is still working. Yes, if one partner is made redundant and the other is still employed, then the redundant partner should definitely be able to claim the full dole payment (but only when redundancy occured). Yes I think everyone should be entitled to something, to be able to contribute to their portion of the weekly costs. Even the basic costs these days are barely covered by a reasonable full time wage. I think there should be some kind of assistance for people who are made redundant and are married or in a relationship...I think it just takes one look at the mortgagee sales to realise people need more help than what is on offer! I think it should be decided on the income that is left coming into the house and probably the threshold in NZ needs increasing with living costs sky rocketing. Yes, you should be able to get the dole if your partner is working. I do not expect any readers of this blog will be silly enough to fall for this .... but, I just received the following e-mail. We are planning big changes for 2009 at McDonald's Australia chain of restaurants and because your opinion is very important to us, we invite you to take a short Customer Satisfaction Survey that will help us improve the quality of our food and services. We know your time is valuable, so we will give you a $50 bonus just for taking our quick 7 question survey. The entire process will take no more than 5 minutes. Terms and conditions apply. Click here to take the survey. You can participate in this survey only once. It takes you to a very authentic looking site. The give away is the spelling mistakes. But if you can't spell, a widespread affliction as indicated by the comments people make on the net, you might not notice. After filling out a survey it then asks for your credit card details in order to pay you the bonus. I was going to let McDonalds know but they are on to it. It has been brought to our attention that a fraudulent email relating to a customer satisfaction survey has been circulated claiming to be from McDonald's New Zealand. This email was not sent by McDonalds New Zealand. The survey requests amongst other things, credit card details, citing that participants will be credited with a $50.00 voucher. Please be aware that McDonald’s NZ only use reputable research companies and would never request bank or credit card details. Hoax emails come from known and unknown sources and email addresses in most cases can be 'spoofed' (term for a spam email whereby spammers make the email appear from someone other than the actual sender). Please disregard and delete this email if you happen to receive it. Keith Rankin and Susan St John want the dole to be available without the means-testing of a partner's income. However, the choice New Zealand made way back in 1938, was to create an unemployment benefit (paid for initially through a new tax but later - c 1964 - out of general taxation) that was available to all, with no time-limits or reducing payments over time, regardless of how much or whether recipients had paid in. The price for this was means-testing. If we want a more generous unemployment benefit, with more generous entitlements, then we need tailored unemployment insurance. In fact, people can already take out loss of income insurance privately, but many argue, why should I pay twice? I have every sympathy with those people being made redundant and finding they do not qualify for the dole because their partner's income is too high. They have paid taxes only to find they aren't supported in return. It isn't fair. But then I have spent years arguing that the welfare system isn't fair. By the way, the Australian income test limit provided in the NZ Herald doesn't look right to me. Here is the NZ limit of $534. That's right. But the following is how the limit is calculated in Australia. Partner income which exceeds the cut-out point also reduces your payment by 60 cents in the dollar. The cut-out point looks like $775 per fortnight or $387.50 per week. So you can get the dole if your partner works but it will be abated at the rate of 60c in the dollar if you partner's income exceeds $387.50 per week. The dole pays $204.50 per week. If 60 cents is lost on every dollar of income your partner earns over $387.50 your eligibility would cut out when their income reached $728.33 - not $1069. I could be wrong but wild variations eg $534 versus $1069 invite suspicion. Update; NZ Herald - In Australia, the dole is reduced by only 60c for every dollar of a partner's income above A$387.50 ($485) a week, so a partial benefit is available until the partner earns A$1069 ($1340) a week. Now I see the mistake. The writer has used the fortnightly dole figure of $409 to calculate a weekly cut-out point. Did this piece go out in the hard copy NZ Herald? A 9 and 4 year-old left to play in a park by their father, George Kenton. Would I do that? Probably not because I am an overly anxious parent. I envy the parent that can make that decision, who is confident the 9 year-old is able to adequately care for the 4 year-old. Maybe if the park was nearby I would be comfortable. The 9 year-old is no problem but 4 year-olds can be unpredictable. But surely it isn't the business of the state to scrutinise parents to this degree? Sure, we can go on about "what-if". But what-ifs rarely happen and if we proceed on the basis of what-if, nobody would be doing anything. We would all be in a state of paralysis. I am bloody sick of the state and the evolving law it devises to impose a suffocating strait-jacket culture on parents. I really don't know what those of us who feel this way can do.